I found out about this book from the InfoQ blog -- the book is called Continuous Integration: Improving Software Quality and Reducing Risk and it is written by 3 guys from Stelligent, who also blog regularly on testearly.com. Seems like a very interesting and timely read for people interested in automated testing and obviously in continuous integration (which to me are the 2 first stepping stones on the path to 'agile testing'). You can also read a chapter from the book in PDF format: "Continuous testing". 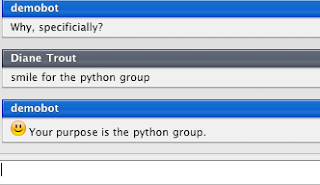 Just published the notes from the SoCal Piggies meeting we had last week on the "Happenings in Python Usergroups" blog. Keywords: jabber, xmpppy, orbited, comet. Today's Dilbert cartoon shows that even the PHB can think "agile". He tells Dilbert to go write his own automated test software, instead of buying off-the-shelf. That's got to be agile, with small "a" :-) Of course, it's not recommended to call your team members "big babies" during the stand-up meeting. How did it guess??? I used to not be a big believer in AI, but now I'm sold. After a long hibernation period, the Pybots project shows some signs of life -- I should probably say mixed with signs of death. Elliot Murphy from Canonical added the Storm ORM project to his AMD64 Ubuntu Gutsy buildslave, while Manuzhai and Jeff McNeil had to drop their buildslaves out of the mix, hopefully only temporarily. In Manuzhai's case though, the project he was testing -- Trac -- proved to have maintainers that were not interested in fixing their failing tests. In this case, there is no point in testing that project in Pybots. Hopefully Manuzhai will find a different, more test-infected project to run in Pybots. Pownce is yet another social networking site, but with the added twist that the creator of digg is one of its founders. Read about the technologies used to build it (Django included) here.